From a garage in Dallas, four men run a business in their spare time, using scavenged components and their knowledge of physics, computers and engineering to devise patentable tweaks to existing technology in the hope of getting rich. Two years, fourteen patents – and the best they have managed is disenchantment with each other and a marginal mail-order business selling JTAG cards. However, while experimenting with superconductors, Aaron (Shane Carruth) stumbles upon something peculiar – the system they have built puts out more energy than they put into it. He and Abe (David Sullivan) keep it secret from Phillip (Anand Upanhyaya) and Robert (Casey Gooden). They realise that ‘the easiest way to be exploited [is] to sell something they did not understand’ but also, over following weeks and months, that they are ‘out of their depth’. Until one day, Abe takes Aaron step-by-step through what he has learned – they have actually created a kind of time machine. If they switch it on at time A and enter it later at time B, they can return to time A; but this also means that between times A and B there are two of each of them coexisting. Abe is anxious to avoid messing around with causality, but things start to go awry when the much less cautious Aaron begins to fantasise about getting revenge on an investor who messed them around: Aaron imagines assaulting him and then going back in time to tell himself not to do it. He dreams of acting with impunity, of becoming so rich that he is above the law. Actually, things go awry much sooner (or possibly later) than that: Aaron grasped the machine’s potential more quickly than Abe realised and has been deceiving him, carrying out his own agenda. Aarons and Abes multiply, attacking other versions of themselves. Disagreements escalate. Aaron and Abe appear less frequently in the same shot, and when they do they are often separated not just by distance but by the vertical lines of background architecture or ominous black shapes. Placing all that has passed under erasure, the story ends – I think – at some point between the start of the film and Abe’s first use of the time machine. An Abe is sabotaging the machine while the original Abe (or possibly the same Abe, only earlier) is building it, in the hope that he will give up (read backwards, his surname, Terger, provides a clue). An Aaron, somewhere overseas and apparently with corporate or state backing, is constructing a much bigger machine, while the original Aaron (or possibly the same Aaron, only earlier) continues to live with his family. I think. Writer-director-editor and co-star Carruth (he was also responsible for casting, production design, sound design and the film’s original music) is rumoured to have shot a scene in which everything is explained, but if so, he was wise to cut it – and not only because it must have contained long and stilted dialogue (and probably lots of diagrams). The film is effective because of its refusal to clarify what we see and hear. Fresh but often elliptical information demands that we, like the protagonists, revise our understanding of earlier scenes, which in turn alters our understanding of the information. Multiple viewings are required for those who wish to figure it out, but, like Videodrome (1983), I am not certain it can be – and this renders it probably unique among American time-travel fictions. For example, unlike the Back to the Future ( 1985–90) and Terminator (1984–2003) trilogies, it is not easily reducible to an oedipal primal scene fantasy; and however much their final reels might prattle about the future not being fixed, they lack Primer’s more thoroughgoing destabilisation of temporality, duration, narrative, memory and identity. This contingency of meaning and self-conscious ambiguity is more akin to modernist European time-travel fantasies like La jetée (1962), L’anné dernière à Marienbad (1961) and Je t’aime, je t’aime ( 1968) (Primer’s womb imagery, aural rather than visual, seems to allude to the latter in particular). 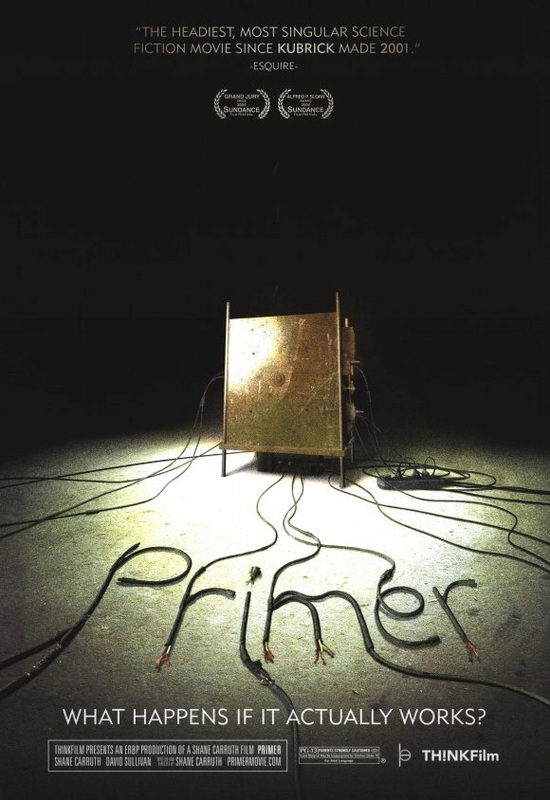 Like these nouvelle vague films, Primer is also a meditation on cinema itself. Although it is a coincidence that the Lumière brothers ‘invented’ cinema in the same year that Wells published The Time Machine: An Invention (1895), there is a complex interconnection between time-travel and motion pictures that goes beyond the Wells/Paul patent for a never-constructed fairground ride/exhibition space that reconstructed the Time Traveller’s voyage. The projected representation of past moments, undercranking and overcranking the camera so as to produce fast- and slow-motion, editing out frames or editing them together – these are all experiments in altering time, reconstructing it so as to be experienced differently. (And it is worth recalling that Alain Robbe-Grillet’s script for Marienbad was inspired by Aldolfo Bioy Casares’s neglected sf novel La invención de Morel (1940), whose title nods to Wells but whose story of a man who falls in love with an unattainable woman in a virtual projection of a recorded past was itself inspired by the author’s fascination with silent movie actress Louise Brooks.) Early in Primer, when the garage door rolls shut, the inventors remain visible through four windows in it: the image looks like four frames of film unspooled across a black background. In several scenes footage overlaps, repeats from the same and different angles, the action apparently stuttering; perhaps a consequence of shooting insufficient coverage, it nonetheless disrupts and thus becomes instructive about the ways conventional editing creates the illusion of continuous time and space. Elsewhere, jumpcuts compress time, to similar effect. Reality becomes subject to multiple takes, events can be revised and erased; a key incident is ‘reverse-engineered into a perfect moment’. Technical errors during filming left much of the sound recording unusable; the post-synchronised dialogue and ambient sound often just don’t sound quite right, further alienating the viewer, especially during scenes dominated by hard-sf speak. The film contrives to hold the viewer at a distance while its characters do little to evoke a sympathetic response, making it something to scrutinise rather than wallow in – not that one would want to: the world it creates is far from appealing (shot on super-16mm, and blown up to 35mm via a digital intermediary, it is dominated by sickly greens and yellows), and not just in terms of its appearance. Roger Luckhurst argues that the figure of the heroic scientist – whether Ralph 124c41+ or Thomas Edison – emerged in popular culture just as the real-world efforts of the latter and his ilk were industrialising and commodifying the processes of technological innovation, effectively removing it from the realm of the individual creator. Just as La invención de Morel explores capital’s colonisation of the unconsconscious in terms of the articulation of desire through the commodified image of an actress, so Primer sees the logic of capital spread into every aspect of its protagonists’ being. They work 30 hours per week in the garage on top of their day jobs. Robert proposes a project which might be fun, but Aaron and Abe dismiss it because it is unlikely to reach a marketable stage. Alienated from their labour and from whatever pleasure they derived from tinkering with things in the garage, all they want to do is produce the tweak that will make them rich. They have instrumentalised their skills and desires, and compartmentalised their lives. Unable to produce a profitable device, they instead use time-travel to pick up information on stocks and shares. The fantasy of free energy (and self-replication) turns into the fantasy of immaterial capital boundlessly reproducing itself. By explicitly rejecting the lottery in favour of the stock market they throw themselves into capital’s annexation of our future. That their experiment is doomed is suggested throughout by the sense that life cannot be compartmentalised, that causation is complex rather than linear. At one point, Aaron ‘accidentally’ reproduces his cell phone, and when it rings he has to work out whether the network will contact both identical phones or just search grid by grid until it finds one of them. Elsewhere, inexplicably, the father of a girl they know suddenly appears with two or three days of facial hair despite being clean-shaven just a few hours earlier. ‘There’s always leaks,’ Abe tells Aaron, and consequences seem to come not in chains but webs which reach in all directions. Ultimately, this is where Primer differs from nouvelle vague time travel fantasies. They are primarily backward-looking, concerned with memory and the props which secure bourgeois identity. Primer looks to the future, but instead finds a complex present already out of control. Its garage inventors resemble the utopian writers described in Fredric Jameson’s Archaeologies of the Future (2005), but unlike them Aaron and Abe are unable to imagine change, the radical break – the first negation – that makes utopia possible. They are so woven into the fabric of late-capital that they can only conceptualise using this fabulous new technology to leave everything – apart from their bank balances – exactly the same. The market might pretend it is homeostatic, orderly and inevitable, but a fragment of hope can be found in how thoroughly Aaron and Abe are made to learn that the status quo is complex, dynamic and riddled with contradiction.